An artist's illustration of China's uncrewed Tiangzhou-1 cargo ship in orbit on its way to the Tiangong-2 space laboratory. China's bid to establish a permanently crewed space station got a boost today (April 20) with the launch of the country's first cargo supply spacecraft: the Tianzhou-1. The uncrewed Tianzhou-1 cargo resupply spacecraft launched into orbit atop a Long March 7 Y2 booster from the Wenchang Satellite Launch Center in the southern island province of Hainan. Liftoff occurred at 7:41 p.m. local time (7:41 a.m. EDT/1141 GMT) at the spaceport. Space program officials in China declared mission success shortly after the rocket launched and the vehicle deployed its solar panels. Tianzhou-1 is now on track to dock with the Tiangong-2 space laboratory, or "Heavenly Palace 2," where two astronauts spent a month last October in China's longest-ever crewed spaceflight. That crewed mission, called Shenzhou-11,lasted 33 days. A Chinese Long March 7 rocket launches the uncrewed Tianzhou-1 cargo ship into orbit from Wenchang Satellite Launch Center on Hainan Island on April 20, 2017. Tianzhou-1 is a vital element in China's planned space station,which is set to be pieced together in the 2020s. The Tianzhou-1 spacecraft is 34.7 feet (10.6 meters) long and nearly 11 feet (3.35 m) in diameter at its widest point. It weighs 9.4 tons (8.6 metric tons) on its own and can carry more than 6.6 tons (6 metric tons) of supplies, according to a China Manned Space Agency statement. After entering orbit, according to CCTV-Plus interviews with Chinese space officials, Tianzhou-1 is slated to conduct a first docking with Tiangong-2 in a few days. The two spacecraft will then have a two-month in-orbit flight to test the liquid-propellant refueling as well as the cargo spaceship's control of the combined vehicles, CMSA officials said. The two spacecraft will also fly separately for three months, during which time the cargo spaceship will complete its own space science experiments. Then the two will have the third docking to test the automatic fast-docking technology, a test to complete the docking within 6 hours. Artist's illustration showing China's Tianzhou-1 freighter docking with the currently orbiting Tiangong-2 space lab. According to Chinese space authorities, there have been more than 600 ground tests that demonstrated Tianzhou-1/Tiangong-2 docking hardware. 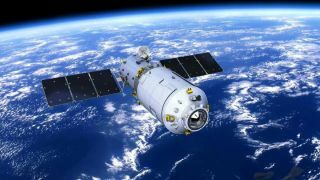 "A space station has two docking ports, forward and backward," said Bai Mingsheng, chief designer of the Tianzhou-1 cargo ship at the China Academy of Space Technology, in a CCTV-Plus interview. "So a cargo spacecraft must be able to dock with the station from both directions. This time, Tianzhou-1 will separate from Tiangong-2's backward port and then fly around it to dock from the forward port to examine the docking ability. This is the primary mission of the combination." "These are new experiments," Bai said in the interview. "A shorter docking time for manned spaceships is of great significance as it will make astronauts more comfortable."